Plot The Course provided Michael with a well deserved first city winner taking out the Alannah Hill Plate over 1600m on the middle day of the Caulfield Cup Carnival. It was a great thrill for all involved with the stable, especially Plot The Courses loyal band of owners. What a way to break your city maiden with Plot The Course showing a sharp turn of foot over the final 200m to get up over the top of favourite Pilote D'Essai from the Hayes/Dabernig yard. 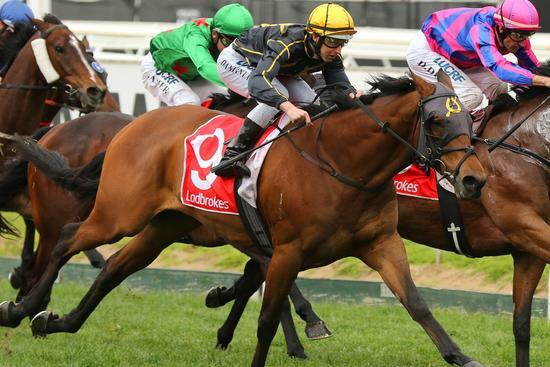 Damian Lane timed his run to perfection after stepping in for Luke Currie who was unable to ride at the meeting and Michael Walker who had already committed to another runner with Plot The Course down to run in the now postponed Cranbourne Cup the previous Sunday. In what was probably a blessing in disguise the 1600m race had Plot The Course well found in the betting. As he does he needs plenty of riding to get him into a good spot over the first 200m which Damian did. Craig Williams on the heavily backed Unbreakable attempted to dictate the race and midrace Plot The Course got shuffled back and found himself in awkward place back near last on the fence. Unlike the owners in the stand D Lane never panicked and hooked the big horse out into the clear balanced him up and he really hit the line to score impressively. Given that he was one of only a couple of horses who made ground out wide on the day gave the win even more merit backed up by him running the fastest 200m of the day. Plot The Course has pulled up a treat and will now head to a race over the Flemington Carnival over 1800m on Cup Day.